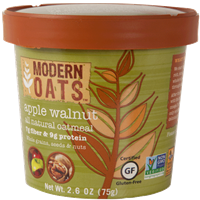 Modern Oats oatmeal can be prepared and eaten in its own container. Photos from Modern Oats Web site. YOU'RE in a hurry and you want breakfast. But not just a piece of fruit, yogurt or juice. You want something hot! 5. Stir well, and savor. Friends, if you've been shopping right, you've just made yourself some oatmeal. Not just any oatmeal, though. Nuts & Seeds oatmeal from the California-based Modern Oats company. This is oatmeal that is delicious, nutritious and can be prepared in mere minutes – in its own container! … More shortly. 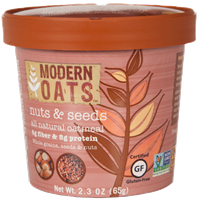 Visit http://www.modernoats.com/ to learn more about Modern Oats oatmeal.